We are all travellers in the wilderness of this world, and the best we can find in our travels is an honest friendâ€, said Robert Louis Stevenson. 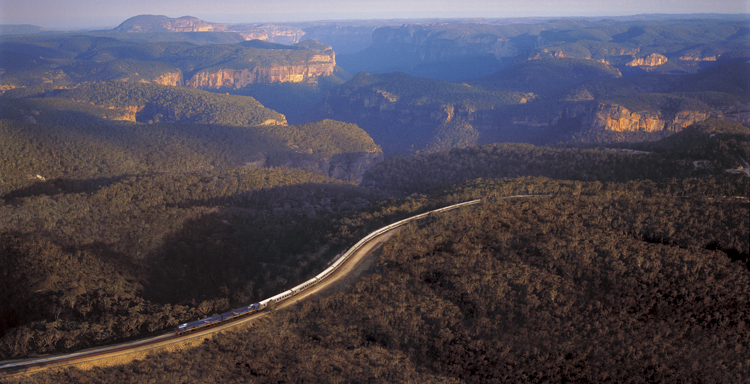 For three days the Indian Pacific and its inhabitants were my friends in the wilderness. I caught the Indian Pacific at Sydney Central Station one evening in June 1982. My friends took me up to the right carriage, and we found my tiny first-class cabin with its folding table, that when put away revealed the bunk where I was to spend the next three nights. "Small but perfectly formed" just about described it - state of the art caravan fit-out, brushed steel and aluminum. The Crème de la Crème of 80's rail travel. We left about 5pm and the train headed west across the plains to the Blue Mountains, the most spectacular part of the journey - which by the time we got there was invisible, it now being quite dark. I don't remember what I had to eat that night, but it was early to bed for me, and I went out like a light. Planes might be quieter inside but no matter how comfortable a first-class full-length fully-horizontal sleeper-bed is on a modern jet, it just doesn't begin to feel as good as a sleeper bunk on a train. Dawn broke with most of NSW behind me, and the aridity of Broken Hill around me. Next Adelaide, then Port Augusta and the Nullarbor. Time to start exploring. I headed for the dining car for breakfast, and found the first-class lounge, where one could smoke. You could smoke in your room too, but more of that later. I quickly realized that I was the youngest person on the train by a factor of 3 decades, with the possible exception of the driver. Chatting to fellow passengers revealed that the reasons my companions were there were a mixture of fear of flying, liking to watch Australia slowly and close up, and retired and all the time in the world. 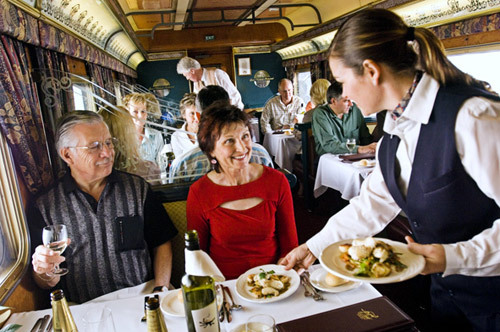 All relatively wealthy of course - the first class rail fare was and is several multiples of the standard airfare. The Nullarbor (Latin for "no trees"), is well-named. Scrub and bushes for as far as the eye can see, and the only sign of life the occasional vehicle on the road that ran alongside for some of the way. I'd been a month in Australia, mostly driving south from Cooktown in Queensland, nice and slow. I hadn't seen much wildlife, dead roos on the side of the road apart, and I put this down to having to concentrate on the driving. So I hadn't seen either kangaroo or emu, and said as much to one of my fellow passengers. Who looked at me somewhat askance. "Mate", he said, "there's bloody hundreds outside the window". I looked where he was pointing and looked, and I couldn't see a thing. He showed me the trick of it. The animals were in large herds - mobs - all moving along parallel to the train - and seeming to keep up quite well. The kangaroos were a reddish brown - the same colour as the soil, and looked like wind blowing over brown bushes, waving. They moved with a flowing motion. The emus were grey-brown, boulder-coloured, and ran jerking up and down as their legs pounded into the ground. Pretty quick movers too. Once I had learned how to see them, I realised that there were thousands of them, in all directions. No wonder I'd been given an odd look. It might have been the smoking though. I had some grass left over from a Sydney party - a gift from my friends - so I rolled up and smoked in my cabin before moving over to the lounge for an aperitif. A knock on the cabin door startled me, so stuffing the makings away, I opened up to reveal the steward for the first class carriages. "Sir", he said, "I've had some complaints about somebody smoking Strong Tobacco". You could hear the capital letters. "Well", says I, "it might be me, I'm smoking Old Holborn. Pretty strong". Not a bad response, I thought, in the circumstances. "But how would anybody know?" I asked. It seems that the air conditioning in those days worked by sucking air in at one end of the carriage and moving it through all the cabins in turn before voiding it from the back. So the poor people downwind had been getting a good noseful. The steward hadn't bothered to enquire anywhere else - I was after all the youngest person for about a thousand miles, and once he'd got a whiff he was round like a shot. Oh well, fair cop, but he did tell me where to go to light up if I didn't want to bother others. That steward was a pretty good bloke. In his 60s. He'd spent his working life on the railways since arriving in Australia as a refugee just after the war. Originally from Hungary, he'd arrived, looked around for work, met another Hungarian who told him it was a good job. All the stewards and other staff on the train were Hungarian, and it seems, all the stewards on all the trains were Hungarian. He told me his story, and despite his work taking him away from home for a week at a time, he was full of praise for Australia for taking him in and providing him with a living. Still speaking with a central European accent, his speech was larded with in-yer-face Aussieisms and there was nothing he hadn't seen in his years on the rails. Breakdowns, accidents, travellers behaving to excess. Seen it all, and highly amused by all of it, he had a great fund of stories. You did what in Kalgoorlie? Our third evening on-board had us stopping for several hours in Kalgoorlie. Famous for the gold mining that takes place all around, it is slap bang in the middle of nowhere. I spent the hours in one of several pubs, listening to some well-told lies: stories I've also heard in bars in mining towns in Canada. The one that sticks in the mind is the one about the Irishman, staggering from just one such pub as this on his way to the next, down the middle of the dust road that passed for Kalgoorlie's High Street. He tripped over a rock, and sprawled in the dust. Struggling to his feet he decided to shift the rock to the side of the road, so as to make things safer. His "rock" turned out to be a massive nugget of gold, too heavy to lift, prompting a second gold-rush, this time in the centre of town. Well, perhaps it was the beer talking. Back on the train again, we left in the middle of the night, and woke up on the outskirts of Perth, well head of time, deliberately lingering so as to arrive on schedule – which we duly did just after breakfast. 24 years on, the time-table has changed: you leave Sydney twice a week at 3pm, and get to see the Blue Mountains before dinner. Breakfast at Broken Hill and second dinner as you leave Adelaide, and arrive in Kalgoorlie after dinner on the day following that. Breakfast in Perth. You can even take a small car, but you can’t smoke.